It’s finally over! The strange winter we’ve had has finally said goodbye and we are now enjoying beautiful spring days. The beginning of spring also means that local produce will soon be finding its way into grocery stores and popping up at Farmers Markets around the city. HEALTH: Buying local means fewer steps between the field and the table reducing the number of opportunities for contamination that can lead to food poisoning. In-season produce tends to have higher nutrition values than their out-of-season counterparts because they’re served up at peak ripeness. ENVIRONMENT: Buying foods grown close to home decreases the distance between the farm and our tables, therefore reducing our carbon footprint. ECONOMY: Buying local produce contributes to the local economy by supporting local farmers and growers. The growing season is short in most parts of Canada due to cold and long winters but spring and summer weather allows local growers to grow delicious produce for us to enjoy. Eating locally also means enjoying fruit and vegetables while they are in season. During the spring and summer months we see the available produce change based on what is growing on trees and in fields at the time. May marks the start of locally grown produce being available and is when we start seeing farmers markets re-opening across the city. Here is your guide to what is in season this month! We start off with only a few seasonal foods being available at this time but the list will grow longer as we get closer to and throughout the summer months. Rhubarb season starts in May. These long ruby red stalks are known for adding a tart yet delicious flavour to desserts and other dishes and are often paired with strawberries, pears or apples to add sweetness. Rhubarb contains calcium, which plays a role in maintaining bone health, vitamin C and potassium, which helps to lower blood pressure. Look for stalks that are bright red and that have full and fresh looking leaves. Discard leaves as they are poisonous. 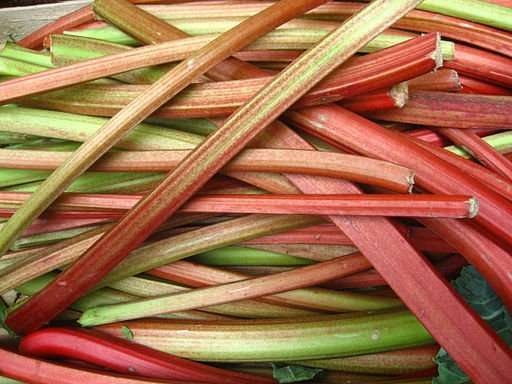 You may have to peel rhubarb to remove fibrous strings, wrap stalks in plastic wrap and store in the refrigerator. Rhubarb can also be frozen. Local asparagus is such a treat! It is much more flavourful than its out-of-season counterparts which travel to us from Mexico and Peru in the off season months. Local asparagus is available in May and the start of June. Asparagus is full of vitamins and minerals that are essential for health including vitamin A which is helpful for immune function, vision and reproductive health. Asparagus also contains vitamin C which is an antioxidant which helps to fight against chronic diseases such as heart disease, cancer and diabetes; it also promotes tissue growth and repair. Vitamin K, also found in asparagus, plays a role in blood clotting which helps to prevent excessive bleeding with cuts and scrapes. There is also folate which is essential in reducing the risk of heart disease as well as neural tube defects. Folate has also been linked to a reduced risk of some cancers. Asparagus also contains two great forms of carbohydrates, fibre and inulin which is a prebiotic that promotes a healthy gut. 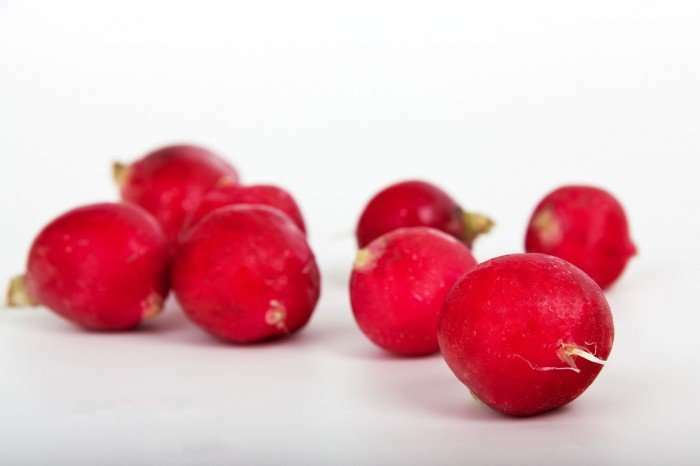 The fiery taste of local radish is available this month. This common addition to salads contains a great nutritional profile. These little fuschia globes are full of antioxidants, including sulforaphane which has been proven to play a role in the prevention of breast, prostate, colon and ovarian cancers. Radishes also contain vitamin C and fibre. Look for radishes that are firm without any cracks or dry spots. The green tops should be fresh looking. Remove radish greens, wash roots well and store in a plastic bag for up to 1 week. Fiddleheads are a very interesting vegetable from the fern family. Fiddleheads should never be eaten raw and must always be cooked. These curly vegetables contain potassium, vitamin C and antioxidants. Buy fiddleheads that are tightly curled, crisp and bright green. Loosely wrap and store in a plastic bag, do not wash fiddleheads until ready to use. To prepare fiddleheads remove the brown papery skin surrounding the fiddleheads, rinse in cold water thoroughly to remove dirt and cook thoroughly, 15 minutes in boiling water. Fiddleheads should always be boiled before sauteeing, frying or baking.